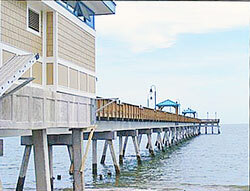 The City of Hampton has two public beaches. Both are popular with local residents. Grandview Beach is a natural area located adjacent to the Grandview Island Nature Preserve. There's limited on-street parking here and no services, but it's a nice beach. 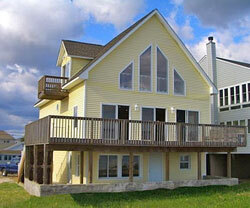 The	best way to enjoy Grandview Beach is to rent one of the homes that backs right up to it. Hampton's most popular beach is Buckroe Beach. It's a nice, wide, sandy, life-guarded beach on the Chesapeake Bay, where the surf is calm, making it a great place for families to enjoy the water. Kayak and peddleboat rentals are available and there's a playground for the kids. Grandview Island Apartment One bedroom apartment with a panoramic views of the Chesapeake Bay. Apartment is located on the first floor of a Grandview Island home and has a private entrance. A short walk to the beach. 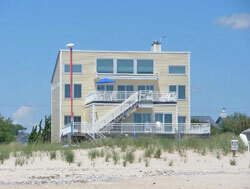 Buckroe Beach House. Located directly across the street from the beach. Three bedrooms, two baths. Buckroe Beach is a primarily a residential neighborhood, so you won't find many hotels night next to the beach. The Sans Souci is a small motel right on the beach. Otherwise, the Crown Plaza Hampton-Marina and the Execustay at Heritage at Settlers Landing, both located on the downtown Hampton waterfront, are the closest hotel options. All Buckroe Beach Area Hotels - See a map of all hotels in proximity to Buckroe Beach.